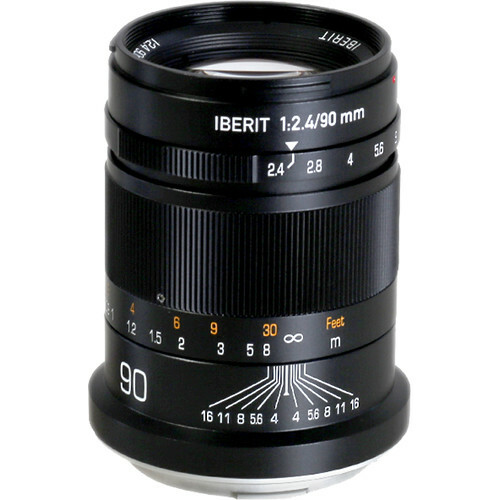 Characterized by its sleek, yet durable build, the Iberit 90mm f/2.4 from Kipon is a short telephoto prime designed for Leica L-mount mirrorless cameras. It uses a simple four elements in four groups optical design to render imagery with a classic quality, and its precise manual focus control affords working with subjects as close as 2.3' away. The all-metal construction realizes a rugged physical design, and the lens barrel's exterior also incorporates both depth of field and focusing distance scales for more accurate focus control. Portrait-length prime is designed for full-frame Leica L-mount mirrorless cameras, however can also be used with APS-C models where it provides a 135mm equivalent focal length. Simple four elements, four groups optical design provides a classic image quality that is also well-suited to use on current image sensors. Manual focus design permits working with subjects as close as 2.3' away. Ten diaphragm blades contribute to a pleasing bokeh quality. Focus ring has a 90° throw and the aperture ring has an 88° angle of rotation. Is the l-mount pricing correct? Why is it so much more expensive in l-mount then every other mount these lenses are available in?